Karina's Kreations: Star of Light Wow Card!!! Star of Light Wow Card!!! We'll be making this Star of light Wow card at my class in Calgary Oct 29. Email me at kchin2@telus.net for more details. 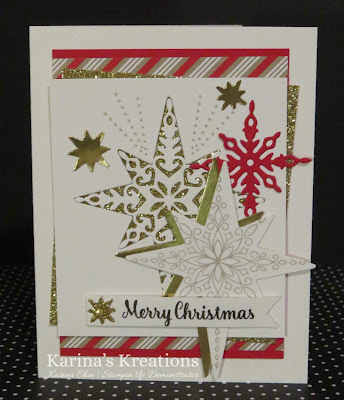 If you live in Edmonton, I'm happy to do a Wow Card Christmas class for you and a few friends. This card is from the front cover of the Holiday catalog. I made a slightly simpler version but this card is gorgeous in person. My picture doesn't do it justice!!! 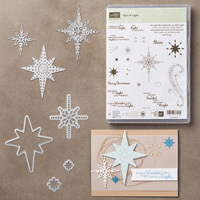 You'll need the Star of Light Bundle #143508, Candy Cane Lane Designer Series Paper #141981, Gold Foil #132622, Gold Glimmer Paper #133719 , Whisper White and Real Red card stock to make this cute card. If you live in Canada, I would love to help you with your order. Click here to place an online order!